For those who have been far from Armenia or who have not actively followed the plethora of developments that have occurred in the country for the past six months, the report encompassing a nearly full picture of the current situation in Armenia has finally become available. “Armenia’s 2008 Presidential Election: Select Issue an Analysis” is a report recently released by Policy Forum Armenia (PFA), a newly founded association. The report is the first of its kind following the February 19, 2008 Presidential Election of Armenia since it provides a full description of the pre-election and post-election events. The report includes both qualitative and quantitative analysis. The information provided in the qualitative sections of this report is mainly based on Armenian local and international newspaper articles, reports released by international organization as well as blogs on the internet. Unlike the primarily technical reports by OSCE/ODIHR, the report does not just limit itself to describing the 2008 presidential elections, but also presents it in the larger context of political and social developments of post-Soviet Armenia. For those who have closely followed the political developments in Armenia, a particularly interesting section of the report may be the section on the “Statistical Analysis of the Official Election Outcome”. In this section the authors utilize a number of tests developed in the 1990s by Sobianin and Sukhovolskiy, and later revised by other scholars such as Gelman, Kaiunov, Michael Myagkov (University of Oregon), Peter Ordeshook (California Institute of Technology), and their co-authors. The analysis of the election results through this methodology indicates inconsistencies in the 2008 Presidential Election. For example, the report reveals that there was much higher voter turnout in the regions outside of the capital city-Yerevan. This is unlikely, as generally considerably more civic activism is observed in Yerevan as opposed to the rural areas. 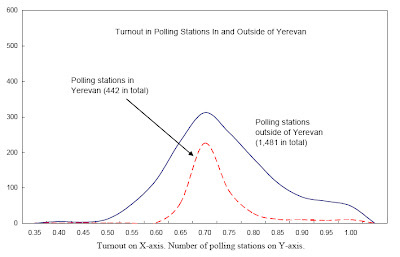 Out of the 1,923 polling stations in Armenia more than 129 polling stations had higher than 90 percent voter turnout (p. 21, see figure below). Such turnout levels are highly unlikely, especially given the high migration levels. The other tests reveal inconsistencies within the distribution of individual candidates’ votes, in the relationship between the candidates’ votes and voter turnout, and within the distribution of invalid ballots. The report is careful to specify that the statistical findings do not provide definitive proof of election fraud, but only an (albeit powerful) indication. Finally, the report concludes with a full section devoted to the civil society awakening in Armenia in connection with the 2008 Presidential Election. More specifically, the final section discusses the increase in the activism especially among women and the youth, as well as the rise in information sharing and networking through the internet. While the report does not provide any innovative recommendations to mediate the post-election discontent in Armenia, it provides a solid ground for policy makers to put the events of the past six months into perspective, assess what the available tools are and put the February 19, 2008 elections into the wider political context of Armenia’s newly independent history. On a side note, similar studies of election fraud and perception were conducted by CRRC fellows in 2005 by Dr. Masis Poghosyan and Sergey Harutyunyan.